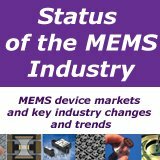 This monthly e-newsletter, written by the editors of Sensors & Transducers Magazine (ISSN 1726-5479), delivers the product and research news, end-use application news, information on upcoming events for MEMS and sensors professionals, and updates you on happenings in the sensor science, industry and markets. The Newsletter reports the latest developments in sensor industry as it happens from leading research centers, universities and manufacturers. Who should read this Newsletter ? All who are interested in the newest information and trends in sensors, transducers, MEMS and sensor instrumentation, including DAQ. 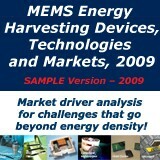 Reportlinker.com has introduced a new market research report, “MEMS : MEMS & Sensors for Smartphones”, in its catalogue. Combination of MEMS components as well as sensors seems to be a new process, but this integration already exists in the mobile phone industry. Since 2002, silicon microphones and FBAR RF filters have been combined on mobile phones. 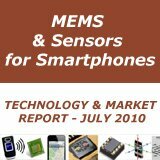 Lately, MEMS accelerometers have become an essential function in feature-phones and smartphones. 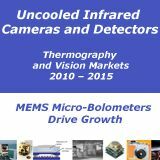 Other kinds of sensors such as CMOS image sensors have also become quite successful. Currently, the mobile phone market is taking a turn rapidly. 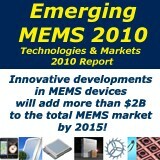 The market research report reveals that the MEMS & sensors market will grow from $3.55 billion in 2009 to $7.91 billion in 2015. 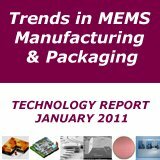 The report has discovered several factors that explain why the MEMS and sensors market will see double digit growth in the coming years. It discloses that 44% of the mobile phones will become smartphones in 2015. Nearly one in three phones will include GPS in 2010. The RF components of cell phones are becoming multi-mode multi-band mobile phones. The recent launch of iPhone 4, which integrates a MEMS gyroscope, is a striking example that shows how rapid changes are taking place in the mobile phone industry. With the introduction of gyroscope, total motion sensor market will reach up to $1.19 billion in 2015 with a CAGR of 25.3 %. Along with gyroscopes, many other changes are also anticipated in the coming years in the mobile phone industry. Gyroscopes are currently reaching the mobile phone business, while the compass and accelerometer are trying to provide distinguishing features. Combination of motion sensors along with an increasing processing part is currently under development. Changes at the radiofront end level due to the LTE effect on multi-mode phones may benefit RF filters, silicon MEMS oscillators and variable capacitors. 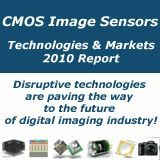 Since CMOS image sensors have already grown, competitors are now trying to develop other features such as WLO, BSI, stabilization or autofocus solutions. 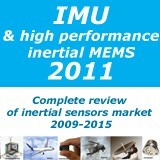 Several other applications such as environmental sensors and microspeakers have been identified as emerging sensors.